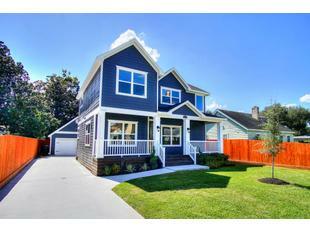 Stunning new custom home features 3 Bedrooms 2.5 Baths with 2 car detached garage. Light and bright open floorplan loaded with high end finishes makes this home is a must see! Great flow as you enter from the covered front porch into the open dining and living room area, breakfast bar and amazing kitchen, large master suite is down and boast executive master bath with separate tub & shower and elegant and clean finishes, bonus room up can be family room or game-room, 2 bedroom and full bath up, Tons of upgrades including double crown molding, Carrier Ac unit, custom cabinetry, hardwood floors, Marble countertops, SS appliances. Loads of storage space. You'll be proud to own and live in this showplace! A true move-in and unpack! Directions: From 610 North exit Irvington go South to Graceland turn left home is down on the right.